The 2016 National Pro Grid League season kicked off on August 17. It’s been nearly a full year since we’ve seen anyone throw down on the GRID, and even though the NPGL has stayed relatively under the radar for the past few months, fans gobbled up the $19.99 live stream early bird special. The live stream though, got off to a slow, choppy start. Both the New York Rhinos vs. Boston Iron and DC Brawlers vs. Baltimore Anthem matches began late, prompting tons of fans to turn to the NPGL’s social media to complain. The stream eventually got going, but was riddled with sound and buffering issues. Luckily, the stream quality improved as the matches went on. It never quite became seamless, but hopefully those glitches will get ironed out as the season goes on. The announcers Chris Doering and Rich Bocchini did an outstanding job of narrating and making sense of the chaos on the floor. 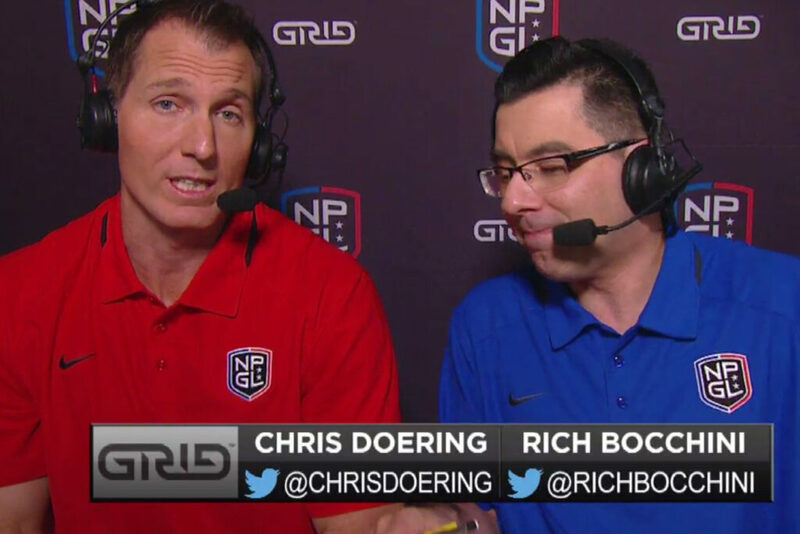 In a sport that moves so quickly, announcers are key to television friendly viewing, and Bocchini and Doering managed to cater to fans while also explaining the basics. The live stream also added graphic intros to the beginning of every race that explained the upcoming movements. This feature was nice, but it would be enhanced if the live scoring graphic incorporated barbell weights, as it can be tough to remember how much these athletes are lifting in each quadrant when the race is actually happening. From a gameplay standpoint, all was familiar on the GRID with a few notable exceptions. First, the League now requires the trailing team to finish the a race within 30 seconds of the winning team. In previous seasons, if one team finished a race well ahead of the other, the losing team could slowly finish the race and get the point without burning themselves out. In some cases, there were minutes left on the clock and athletes took their sweet time. This year, the losing team must finish the race within 30 seconds of the winning team in order to get the point. This change forces the losing team to have a sense of urgency, and helps differentiate between teams that are relatively evenly matched and teams that shouldn’t even be in contention. Second, coaches can no longer throw the yellow Challenge Flag on Race 11. In 2014 and 2015, when matches came down to a point, coaches challenged an arbitrary movement as a Hail Mary even if there wasn’t any legitimacy in their claim. These challenges were a pain to judge and annoying for the audience, so eliminating the option in Race 11 is a good move. It is still possible to challenge, but it has to be done by a referee…and there’s nothing stopping a coach from persuading a ref to make that call. Though there were some technical glitches throughout the stream, one thing is for sure: the athletes keep getting better and the sport is quickly evolving. We’re already seeing new movement developments and benchmarks, such as Boston Iron’s Jessa Lemoine‘s butterfly toes to bar and Wes Kitts‘ lightning speed 145lb muscle snatches. The Brawlers continue to lead the pack when it comes to shaving off time during transitions, utilizing obvious yet creative techniques like having one athlete physically catch the other before dismounting the rings so the rings don’t swing back and forth. The regular season continues through August 27, with the post-season matches running through the first week of September. All matches will continue to be streamed live on GridTV with select matches airing on primetime in the fall.